You are at:Home»Afghanistan»Behind the Cover: Did Lance Cpl. 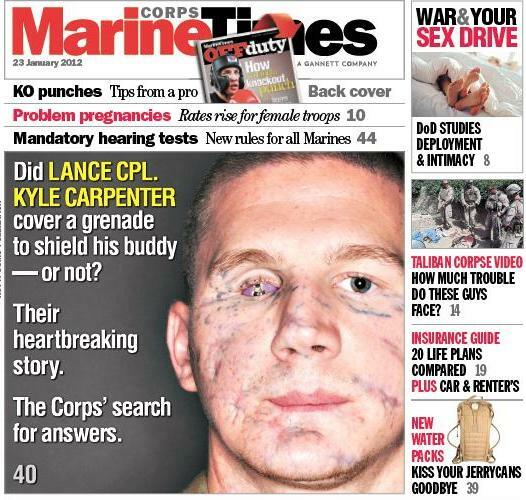 Kyle Carpenter cover a grenade to shield his buddy? UPDATE: An updated version of this story has now been posted online here. You may recognize this face. That’s Lance Cpl. Kyle Carpenter, who was severely wounded in Afghanistan in 2010 when insurgents chucked a hand grenade onto the roof where he and another Marine, Lance Cpl. Nick Eufrazio, were posting security. In the months since the attack, as Carpenter has undergone numerous surgeries to address his injuries, he has become an ambassador, of sorts, for the Marine Corps and its wounded warriors, inspiring family, friends and fellow Marines with his undying optimism in the face of a difficult recovery. He has dined with Vice President Joe Biden, attended events hosted by the commandant — and even mugged for photos alongside college cheerleaders and UFC star Brian Stann. Carpenter came to our attention last year, when we received word that the state legislature in his native South Carolina honored him with a resolution claiming he “took the full blast from an enemy hand grenade in seeking to save a fellow Marine.” He and Eufrazio are the only two eyewitnesses to what happened that day on the outskirts of Marjah. Carpenter says he can’t remember what happened in the moments right before the attack. Eufrazio can’t communicate. The Corps continues to investigate the incident, officials say, and it’s unclear whether all of their questions ever will be answered. … that would put him in some exclusive company. This story is not to be missed. It hit newsstands Monday. You also can subscribe online to read it right now. First off there is no “-or not?”. I was there that day, I was the first one on the roof and I saw the aftermath. There is no doubt in my mind that Kyle jumped on that grenade. Grenades push everything away when they blow up not draw them to the blast seat. Kyle’s upper body was positioned directly on top of the blast seat. Thats the kinda of guy that Kyle was, and Nick was like his little brother. Kyle would have done anything to protect him and he did, to try and associate any doubt with that is shameful. Kyle commited his body to making the ultimate sacrifice it just wasn’t his time. He didn’t try to throw the grenade away and lose a hand, he didn’t try to cover it with a kevlar, he covered that grenade just as he approached everything in life, with everything he had. I didn’t need to be an eye witness to what happened to know what happened that day, Kyle did everything in his power to save his friends life and did. As the corpsman at the base. I was working on carpenter, the extent of his injuries sustained that day it’s only proof enough that this young man rolled onto the grenade that day. If he had not done it the injuries he should of received would of been on the left side of his body not the right. as of the no witness part. A whole squad was there to witness this event and if that’s not enough then the science and physics behind it will prove it true. any one that deals with explosives can tell you that grenades blow up…….they don’t blow down. Kyle will always be a hero. He took a grenade and LIVED…shouldn’t this young man be receiving the Medal of Honor? John, that’s a fair question and one, I believe, the Marine Corps would very much like to answer. To Cpl. Long, Doc Frend and Lance Cpl. Lilly, thanks very much for offering your insights here. Kyle is nothing short of amazing, as you all know, and we are deeply grateful to him for sharing his story with our readers. The guy had a traumatic brain injury. Who would realistically expect him to remember anything? The headline of this article is so misleading. It’s garbage sensationalism that try to get newspapers to fly right newspaper stands and make sales, and front page stories they don’t deserve. The guy who wrote this article sells himself on his personal website as a “Free-Range, Free Wheeling Journalist”. No wonder you never landed a job at a real magazine or newspaper publishing company. He made it seem as if someone was trying to figure out a Scooby-Doo mystery. What these guys did was heroic, PERIOD. End of story the end! Who are you to question the Valor of this Marine? Weather he did or not his buddy is alive due to his actions. Doc Dayawon, I have no idea where you’re getting your information about the guy who wrote this week’s cover story, but that would be me. I have never once called myself a “free-range, free wheeling journalist.” It appears you have me confused with the author of this blog entry. As for the story, we pointed out questions that other Marines in Lance Cpl. Carpenter’s unit acknowledge exist. Those other Marines include the battalion commander. We’ll have a follow-up story in our next edition with even more. Again, it has been a pleasure getting to know Lance Cpl. Carpenter. No one is discounting his sacrifice, or that both he and Lance Cpl. Eufrazio are heroes. They are. For what it’s worth, several of the other Marines in his unit have said they were glad to see us cover his story, and thought the coverage was fair. Just something to consider before you come out guns blazing. How can the military question this, and yet award MOH to vets (possible politically-connected) decades after their service on very flimsy circumstances (e.g., Tibor Rubin, etc.)? Pingback: Lance Cpl. Kyle Carpenter: Brave Soldier Throws Himself On Grenade To Save Best Friend « Go to News!